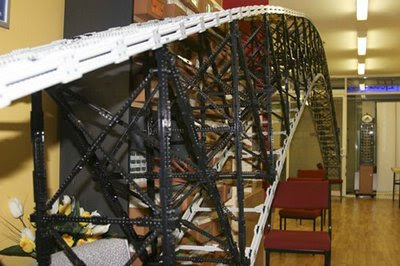 There are people who make bridges out of dry spaghetti, others use LEGO bricks. Members of the Perth Adult Lego Society in Australia chose the latter. The bridge is 14 meters long (42 feet) - if it can hold its own weight it will be a world record. We cannot live without our gadgets. But if they are with us all the time, why not make them from Lego bricks? 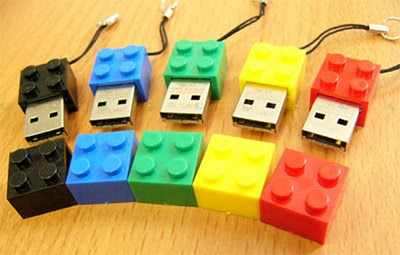 Another sixteen gadgets inspired by Lego here. This pinball machine was introduced at a LegoWorld exhibition a couple of years back and I have found it now. 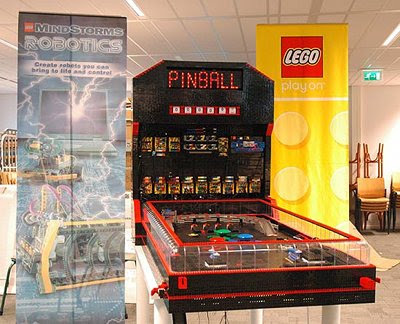 Of course pinball needs a round ball, so it was not made of Lego but everything else was. The creators have used 20000 bricks. It works with a 50 Eurocent coin, it does not accept other coins. The player gets 3 balls but there is a lot of chance to get extra ones, for example by landing in the black hole or get all letters from the P-I-N-B-A-LL sign. Rotating arms and auto-kickback make the game more interesting. The game is controlled by 13 RCX units (Mindstorms computers) and all of them were needed because one has only 2 inputs and 3 outputs. 4 controls the display, 6 the point collector, one the flippers, one the new balls and one the auto-kickback. The table contains 50 lights and 24 motors. The creators claim it took 300 hours to assemble. You can read more here. 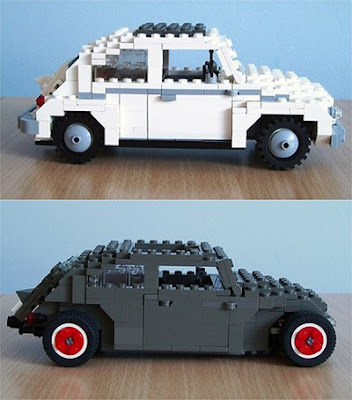 Mad Physicist took his VW Beetle this time to rebuild it as a hot-rod, quite popular in the US. The bodywork is mostly the same but the mudguards are gone, the suspension is lower, the front wheels have moved ahead and the roof is lower too - just like with a real one. 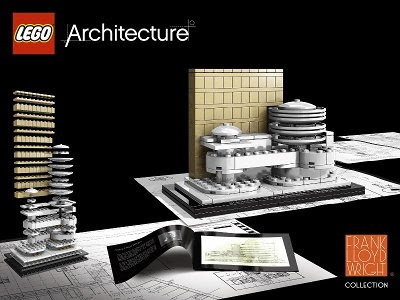 After the first sets from the Lego Architecture series there are some details available about the next ones. 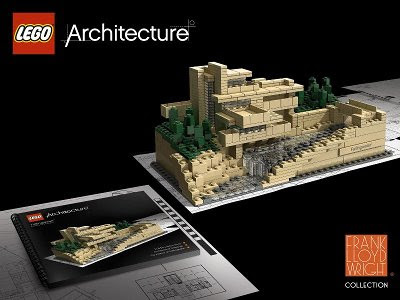 They present the works of famous American architect Frank Lloyd Wright and have more bricks than the previous sets. 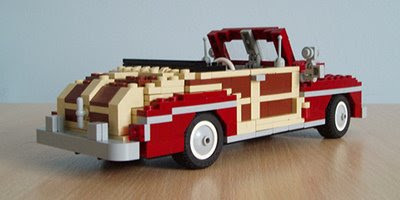 The new sets are the result of a cooperation between Frank Lloyd Wright Foundation, brickstructures.com and Lego. I owed you the next part of the Big Technic Car story for a long time. Here it comes. The line of flagships was simple and logical from the beginning (1977) right until 1999: a single flagship, the throne was always taken by one of the the four cars introduced in the previous part. They were the largest Technic models and since they followed one after another there was no competition amongst them. 1999 marked the start of changes with the introduction of 8448 "Super Street Sensation". This set broke the tradition in several ways. 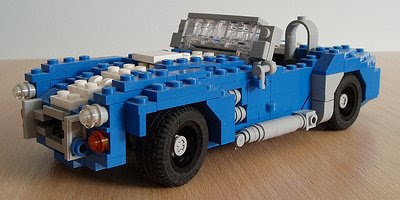 For the first time the bodywork was made of studless bricks, with the chassis was made of old-style bricks but well hidden. The two types of Lego bricks divide Technic fans since then. The car also started a new trend by focusing on the looks and not only packing features. Unlike the all-wheel drive in its predecessor its V8 engine "drove" the rear wheels only. This was also the first car since the original 956 carrying its engine in the front. The number of gears in the gearbox has increased to 5+1, making it a match for most road cars. 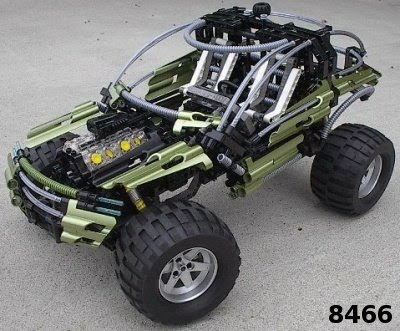 Another first, it was possible to build multiple bodyworks onto the same chassis. As a sports car, it could be built with "gullwing" doors opening upwards or as a "coupe-convertible" with folding roof. 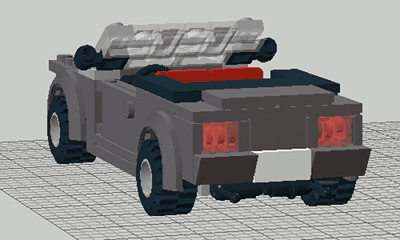 As an alternative it could also have an American style hot rod chassis. The doors were opened with pneumatically damped springs. The lineup has changed fundamentally when a secondflagship, the 8458 "Silver Champion" race car was added. 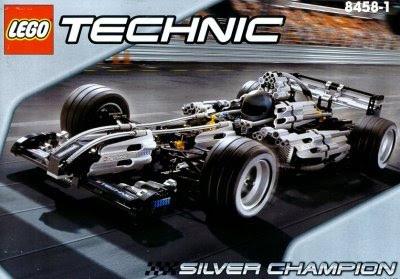 The Silver Champion is in fact a McLaren Mercedes Formula-1 car but it did not carry an official badge at that time. The car emphasises the break with traditions even more: it has less moving parts but a more realistic bodywork including front and rear spoilers. Like all Formula-1 cars at that time, it has a V10 engine and double wishbone suspension on all 4 wheels. It has a differential and steering but no gearbox - its technical content is below the level of the 8865 introduced more than 10 years earlier (not counting the number of cylinders and the bodywork that can be opened). 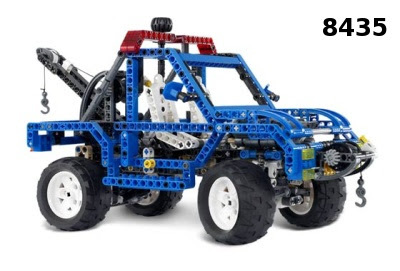 The diversity was increased even more with the introduction of the 8466 "4x4 Off Roader" set in 2001. If two flagships were not enough now there was a third one. Its size was no match for the other models but in working features it was: besides a V8 engine and the gearbox from 8448 it had an all wheel drive and doors opening upwards. 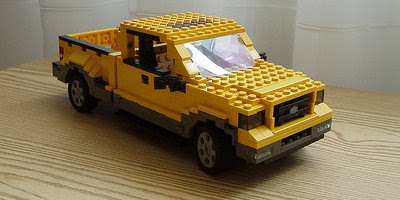 Like the "Street Sensation" the chassis is made of bricks and the exterior from studless elements. The next set in 8461 "Williams F1 Racer" from 2002. 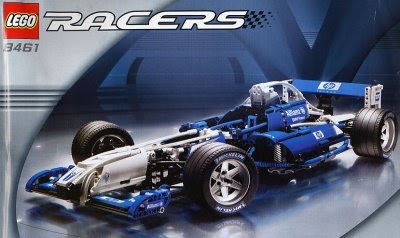 It is basically the rebranded version of 8458: along a blue-white livery and some new parts the biggest change happened in the name: it was an official "Formula-1" licensed product and ran as part of the "Racers" series. The building instructions had about 80% commonality with its predecessor. 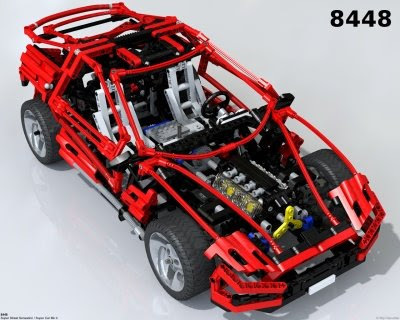 The last set is not really a super car, the 8435 "4WD" introduced in 2004. It is nevertheless worthwhile to mention because it sports many working features that would had made it a super car several years earlier. Contrary to its name it had a rear wheel drive with a V6 engine in the front and working differential in the rear. The front wheels had a functional steering as well as an independent suspension. The rear did not have springs at all but the bridge could be bent relative to the body so it made a real off-road impression. 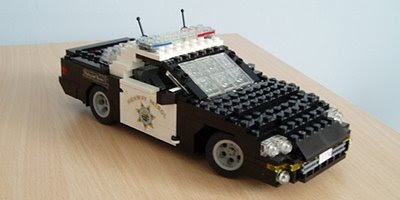 This is the first model that did not have any studded bricks at all, consisting of 763 parts altogether. For comparison, the flagship from 1977 contained 590 parts! Meanwhile I got the first package for the real Mustang - I hope I will get the rest soon as well. My apologies for the temporary unavailability of Lego goodness. 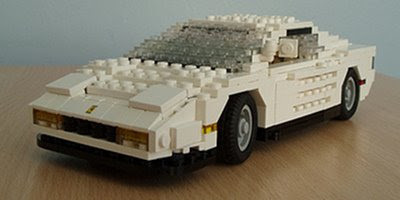 This have stabilized now - welcome to www.bricksngears.com! Same (hopefully) interesting content, more Lego. Go Bricks n Gears! Now that we talk about Mustang - the grand master of pneumatic engines nicjasno published a whole album about the details of his own Mustang. This is much larger than mine and its main task is to test pneumatic engines, but it is very impressive on its own. 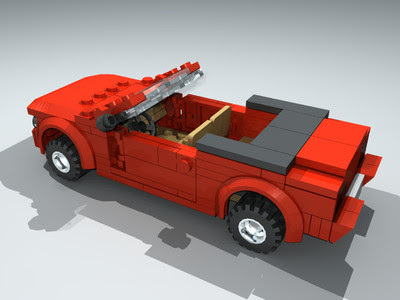 At about 30 studs wide it is very similar to the details of a real car. Although I am a Technic fan, these days I run into many realistic models. I like cars and aircraft most especially if they are not too large like the mini-Technic models from the Arvos or the cars from the Ralph. I got so enthusiastic that I started thinking about how I could build something like that. First I considered replicating the excellent Porsche from the Arvo brothers. I did not drop the idea completely but so far it seems to exceed my capabilities. 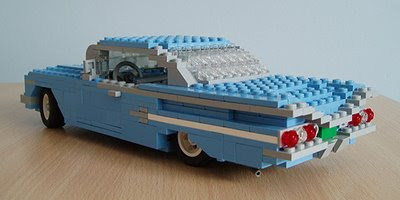 It would take a lot of time to find out how the invisible parts are done and it would take many special bricks like the windscreen ($26 used) or the a rear windows ($15 new), making it expensive. Building small models leads to different challenges than large ones where the scale gives you much more freedom. With small ones one has to brainstorm about putting each brick to its place, considering different alternatives in many cases. It needs special pieces in unusual colors to return the characteristic features of the original. I have no clue about how pros do it but it seems impossible that they have all the bricks on their shelves in advance in the desired colors (it is worth to take a look at the color chart). I have many bricks (ask my wife) but not enough. 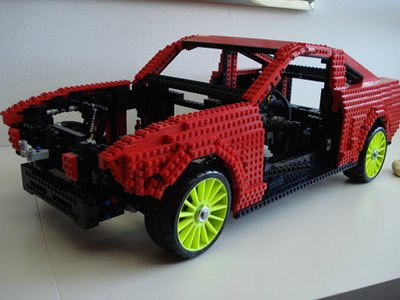 The car will be built solely from newly bought bricks not to limit building. I am also curious how much it will cost. Also, I would like to keep it in one piece forever. This makes designing a bit difficult. 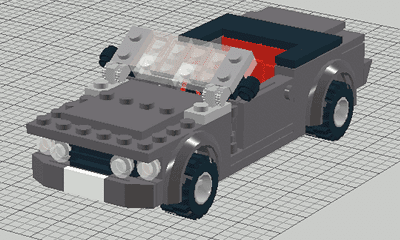 I have built prototypes for certain parts from the bricks I have but the final car is modeled in LDD because I do not know LDraw very well. LDD also makes some sanity checks like checking if all the bricks are connected. The car will be 6 studs wide. This is small but it allows me to use some special parts like the mudguards. This is where planning is at the moment. There will be some parts that will look different and I will use other colors too. But the basic shape can be seen. It seems like $40 will cover the financial side. Ordering was a bit complicated because there are some part I could find only at one merchant, so I had to order from 4 different shops to cover everything. So far so good. When it is ready it will go to brickshelf and of course I will tell you about it on the blog too! Ralph probably noticed that we are talking about him and created a nice page to explore his creations so far. If you would like to have more of the pleasure click here. We already covered airplanes from the Mad Physicist (Ralph Savelsberg) (here and here), let's take a look at his cars (click on the images). Each single one is perfect. It is worth to take a look at details like the wheels - almost each one of them is different even though the scale is roughly the same. Likewise, the mirrors, etc. We already discussed how one can play Lego with a computer instead of real bricks. We mentioned LDraw and SR 3D Builder. 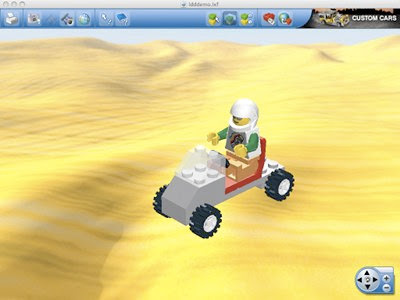 Let's go back to the alpha an omega of virtual building now: Lego Digital Designer (LDD). 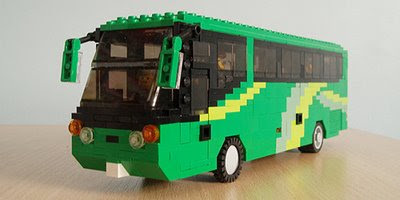 The most important difference is that LDD is Lego's own official product available for free from ldd.lego.com. Unlike the other apps mentioned LDD is not open source. This is a drawback because there is no way to hack it and insert new bricks for example. This is also a plus because hacking is not required - you just need to download and install it. 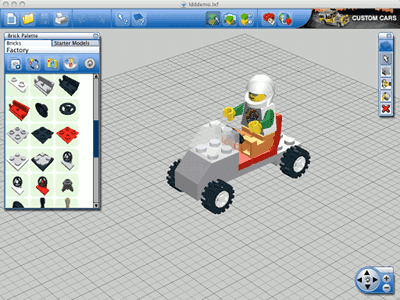 Another plus is that it is well integrated with other services from Lego. What you build can be uploaded into a public gallery and even bought as real bricks (depending on your country). You get a photorealistic view while building. LDD models the physics of elements. You can put bricks only where they fit. They can be rotated or selected based on connections. It does not model rotating gears, though. The ready model can be rotated or viewed between different backgrounds. Since this is built into the app it is convenient, but our images will not be as nice as with the LDraw - Pov-Ray duo. After a click and some thinking it presents you with building instructions too. Handy if you are about to order physical bricks. I am sure free software believers will not like me but I think LDD is more intuitive and easier to use than say LDraw. If you would like to try virtual building for the first time I recommend LDD. 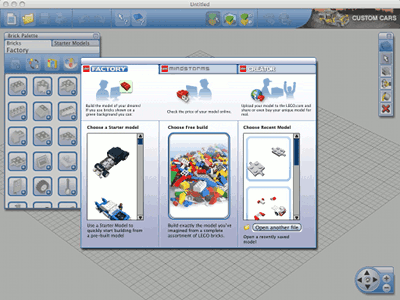 After starting it you have to choose whether to build from Factory, Mindstorms or Creator bricks. Building from the Factory bricks allows you to order your creation online from real bricks. If you made up your mind, you can choose from half-ready models, starting from scratch or from your own earlier models. On the left hand side you can choose the bricks - not all of them are available in all colors, this limits building a little bit. Technic elements are very rare, the selection support City-style building most (in case of the Factory bricks). Select. Selected bricks can be rotated and moved the same way as new ones. You can select single bricks, bricks within a rectangle, connected bricks etc. Clone. You can copy without limits. Hinge. You can rotate parts like propeller, arms and legs of minifigs, etc. Paint. If the selected part is available in other colors, you can re-color it. 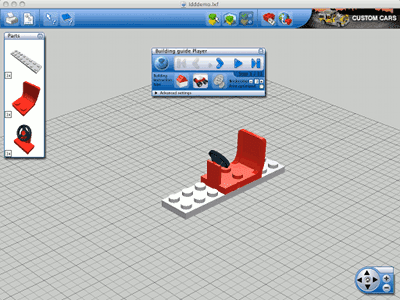 When done you can upload your model to factory.lego.com (after registration). 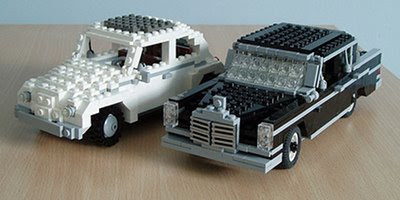 You can even order your own or others' sets - it is not more expensive than a factory set with the same number of bricks. LDD does not let you build if the bricks do not fit. There are some borderline cases though that fit in reality but not according to LDD. 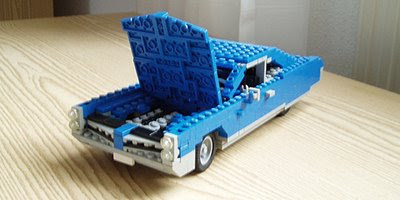 With larger models it happens sometimes that small errors accumulate and some bricks do not fit unexpectedly. For example I have managed to save a design that LDD could not load the next time because of this. Bricks available in the Factory change a little bit over time. It is possible that you could order a set yesterday but not today. Create building instructions may take minutes if the model is large. A "Mirror building mode" would be very useful - SR 3D Builder is better here. As usual we have more pics in the album. Have fun!